Unless you can attend the Environmental Strategy Programme Board (meetings not open to public), or are a member of the Neighbourhoods Scrutiny Committee, you can’t get hold of the quarterly progress reports already being produced by the Council. 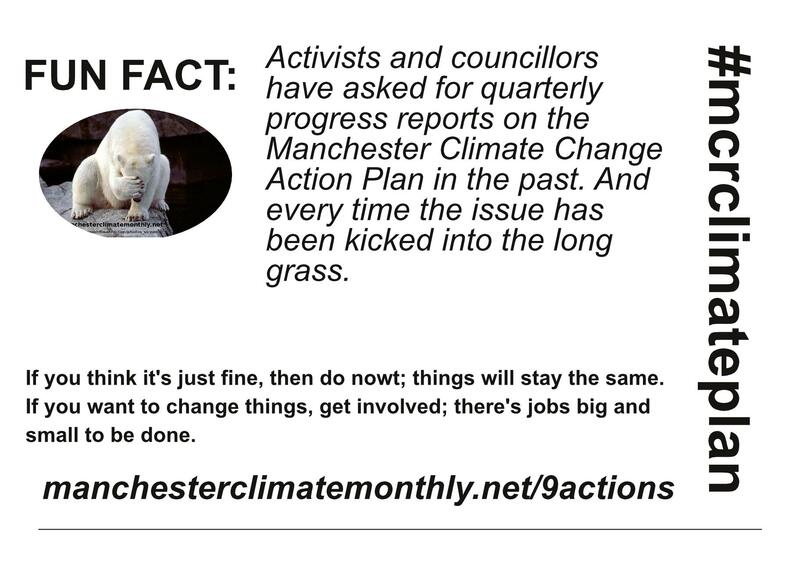 Ensure that quarterly progress reports on the Climate Plan 2014-17 are presented to elected members, in all relevant scrutiny committees, and published prominently on the City Council’s website. To establish goodwill, immediately publish all existing quarterly progress reports in a publicly accessible place, without waiting for someone to go to the effort (and bother to you) of using the Freedom of Information Act. Commit to releasing all future progress reports before the meetings of the ESPB, so these can be analysed by interested parties and questions put to the ESBP in writing. The reports already exist. It’s simply a question of publishing them. Whoever is currently charged with sending them to the ESPB members. What a great example! What an encouraging precedent! Credibility blackhole of monumental proportions, as each year’s plan falls further and further behind schedule. Remember, until July 2013 councillors were being assured that the 20% reduction by 2014 was going to be delivered. It now emerges that the reduction will be – at absolute best – 13%. If quarterly progress reports using non-shifting baselines and plain English had been circulated widely, would we be in quite this mess? Possibly from a molecules-of-carbon-dioxide point of view, but not in a crisis-of-credibility way. See Execution Plan above. Simples. See Execution Plan above. Simpleser.